Recently I had to track down a minor bug in the OpenBSD kernel. 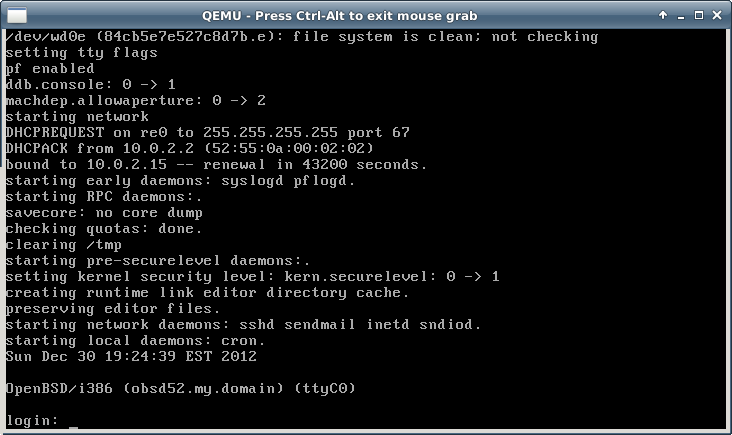 I tapped QEMU and GDB as debugging tools for the task, running on Ubuntu 12.04 as the host OS. This combination worked extremely well, so for the record here’s how I set it all up. OpenBSD comes equipped with two kernel debugging mechanisms: ddb and kgdb. ddb(4) is an in-kernel debugger, enabled by default in the GENERIC kernel, and can be invoked either explicitly from the console or automatically in the event of a panic. It is analogous to the Linux debugger kdb in that it can be used to set breakpoints and examine the stack or register state, but (like kdb) it is not a source-level debugger. Wait for the CD image to boot and then install OpenBSD in the usual manner. When prompted, specify that the SSH server should be started by default, as this will be needed shortly. Reboot into the new guest OS when the installer has finished. When the guest is booted, SCP from the host to copy the kernel source tree and build output. The VM will halt when you connect the debugger, leaving you free to set system call breakpoints or inspect state before continuing. I'm Mark Shroyer, a software engineer in the San Francisco Bay Area with particular interests in development tools, distributed services, and embedded systems.